Viewing 24 of 32 items. 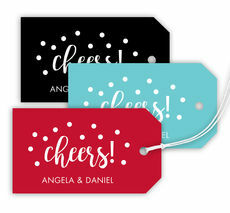 Set of 8 personalized wine tags flat printed in the ink color of your choice. The same imprint must appear on both styles of tags. Size 2.75" x 7". Positioning and design only as shown. Your.. These chic set of wine tags are an unexpected way to add pizzazz to any bottle of wine. Your personalization will be flat printed in the ink color and typestyle of your choice. Size 2.75" x..
Set of 8 personalized wine tags. Flat printed in your choice of ink color and typestyle. Size 2.75" x 7". Positioning & design only as shown. .. These chic set of wine tags are an unexpected way to add pizzazz to any bottle of wine. Your personalization will be flat printed in Coral ink color as shown with your choice of typestyle. Size of.. These chic set of wine tags are an unexpected way to add pizzazz to any bottle of wine. 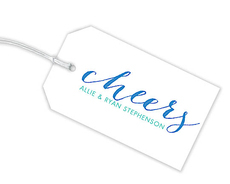 Your personalization will be flat printed in Navy ink color as shown with your choice of typestyle. Size of tags.. These chic set of wine tags are an unexpected way to add pizzazz to any bottle of wine. Your personalization will be flat printed in Sunshine ink color as shown with your choice of typestyle. Size of.. These chic set of wine tags are an unexpected way to add pizzazz to any bottle of wine. Your personalization will be flat printed in Navy ink color as shown with your choice of typestyle. Size of.. 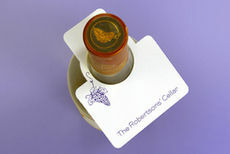 These chic set of wine tags are an unexpected way to add pizzazz to any bottle of wine. Your personalization will be flat printed in ink color as shown with your choice of typestyle. Size of tags is..
Add your personal touch to your gifts this season with this set of colored paper gift tags. Sized 2" x 3.5". Flat printed in ink color as shown. Your choice of typestyle. Positioning only.. These chic set of wine tags are an unexpected way to add pizzazz to any bottle of wine. Your personalization will be flat printed in Dark Grey ink color as shown with your choice of typestyle. Size of.. These chic set of wine tags are an unexpected way to add pizzazz to any bottle of wine. Your personalization will be flat printed in Tangerine ink color as shown with your choice of typestyle. Size of.. Hang these personalized tags on wine bottles in your cellar or wine rack and easily find the wine you are looking for - - no need to pull out every bottle. Or - - use them to decorate any bottle you.. Hang these personalized tags on wine bottles in your cellar or wine rack and easily find the wine you are looking for - - no need to pull out every bottle! 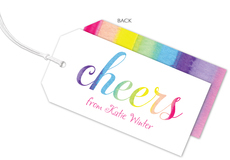 Or - - use them to decorate any bottle you..
Set of holiday personalized wine tags flat printed in the ink color and typestyle of your choice. The same imprint must appear on all tags. Size 2.75" x 7". Positioning and design only as..